Art = Life at R.L. Delight Fine Art: Road Trip! I am back from a wonderful thee day, two night road trip. 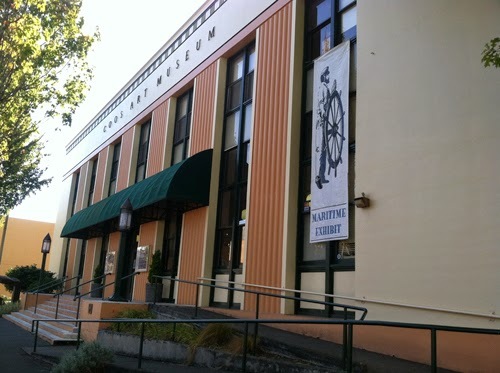 I wanted to see the Maritime Exhibit at the Coos Bay Art Museum put on by the American Society of Marine Artists. I missed the international one that came through last year. This year is the regional one. I am pretty isolated up here and it was good to get out and see what others are doing. 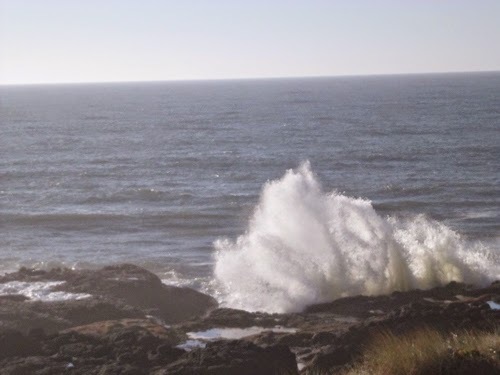 Coos Bay is about a 5 or 6 hour drive down the Oregon coast from Manzanita. 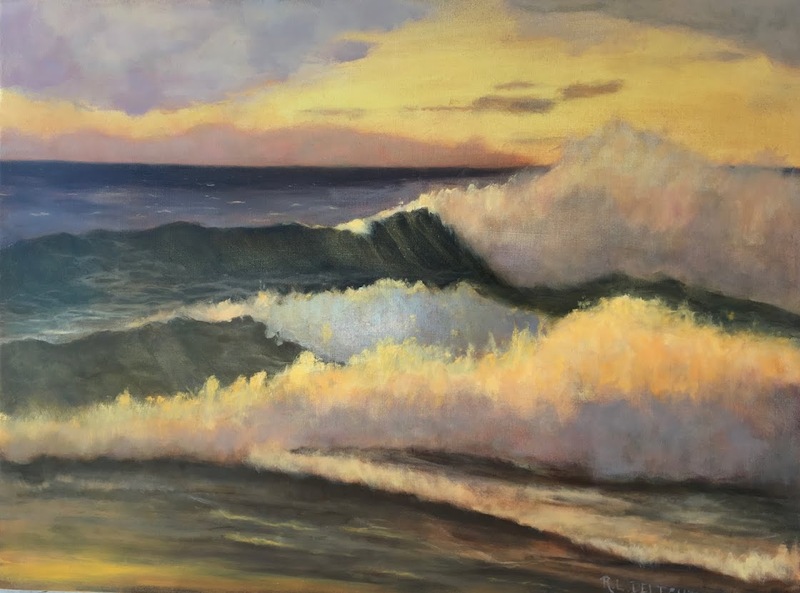 I decided to make a couple day trip of it so I could check out the coast with an eye for good painting spots and also to have a chance to do a little painting as well. 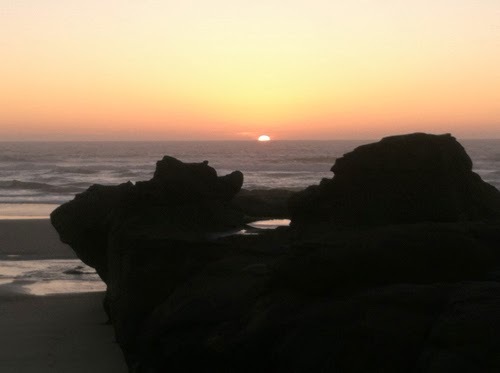 I stayed two nights in Yachats, one of my favorite little towns on the central Oregon coast. 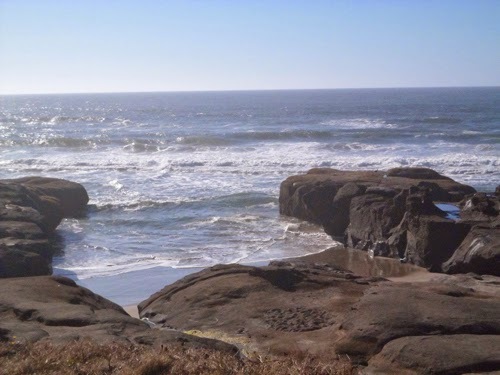 All of the Oregon coast is beautiful but I find the central coast particularly so. 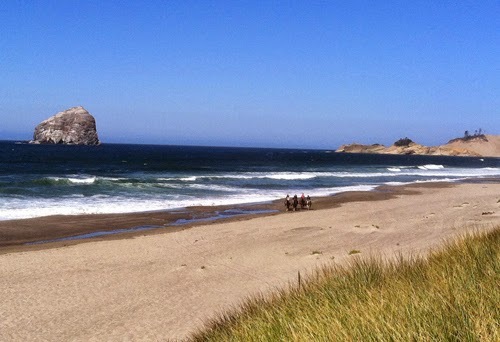 I took a scenic detour on the way down and swung by Pacific City which is off of Hwy 101. My next stop on the way south was at Boiler Bay which is on the north end of Depot Bay. 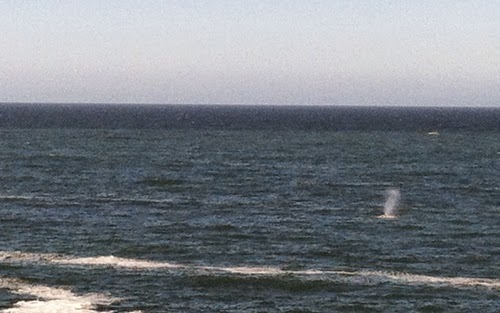 I had an unexpected treat as there were migrating gray whales passing by. I was in no hurry so I spent a while watching them swim by. They were so close you could hear them spouting. I made a few more stops along the way but finally arrived at my destination, The Fireside Hotel in Yachats. I got the least expensive non-view room but I could still see the ocean from the side of the front window. 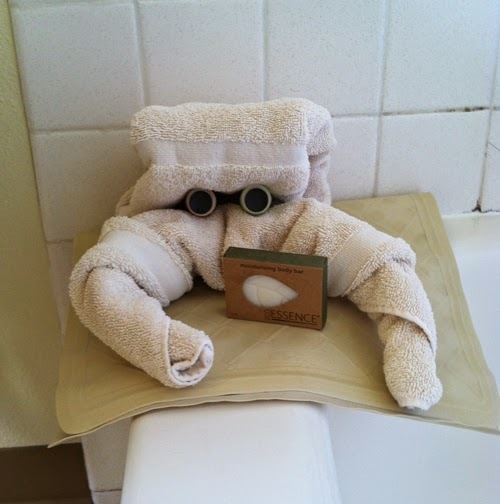 The rooms were clean and comfortable. I would recommend this place to stay. It sits, along with other hotels and houses, right on the bluffs above the ocean. Beautiful! I had a nice long walk before dinner along the historic 804 path. The path is dotted with memorial benches and tables to enjoy the view. It was quiet at night and I slept well, lulled by the familiar sound of the sea. The next morning I took another walk as the sun rose over the coastal mountain foothills. 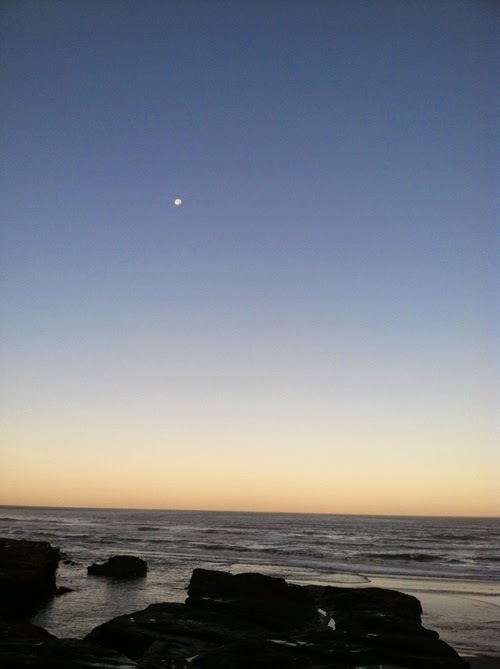 The moon was still hovering over the ocean as the sun came up. I left at 8am and drove down to Coos Bay. I got there just at the museum opened and enjoyed looking at the exhibit all by myself. The exhibit was very educational for me. I will talk about it in a bit more detail in my next post. After I spent a good long time at the exhibit, I drove a little further south to meet with a friend and classmate I haven't seen in 30 years! It was quite a treat and we had a good time trying to catch up. On the way home, I started having car troubles. A radiator leak to be exact. The engine was starting to run hot. I stopped to get gas and then pulled over to have a look as the gauge was starting to look alarming. What a mess! It wasn't at critical yet so I nursed it along to the nearest Fred Meyer store where I was able to buy radiator fluid, and a stop leak additive. I must mention, I was also on the phone to my mate periodically who talked me through the whole thing. I added some fluid to the overflow tank which the car manual said to do. The sun was going down and I didn't have time to wait for the engine to cool down unless absolutely necessary. I decided to make a shot to get back to the hotel room which was about 18 miles or so up a winding, narrow coastal road. I made it back to the hotel room not long after the sun went over the horizon. It as a bit tricky through some spots. Needless to say I was very relieved and exhausted too. I got back a little before 8 pm. The car cooled overnight and this morning I added all the fluids. I had planned to paint this morning but the car was too much of an unknown factor still. I was completely distracted and I knew I wouldn't be able to concentrate due to worrying about the drive home. I packed up and left. It was a very hot (for the coast) and beautiful day. I stopped at an auto part store to pick up radiator hoses as we figured they needed to be replaced anyway. The car ran fine! Apparently the stop leak additive worked like a charm. I made another stop at Boiler Bay to enjoy the migrating whales and then headed north again to home. It has been an enjoyable little trip overall. I am disappointed I didn't get to paint as I had planned but I will just have to go back. I did achieve my main objective of the trip and got in several bonuses too. It has been a grand little adventure and I have a lot to think about. A touching memorial for two strapping young men swept into the cold water by a waist high sneaker wave. They were dead in three minutes. 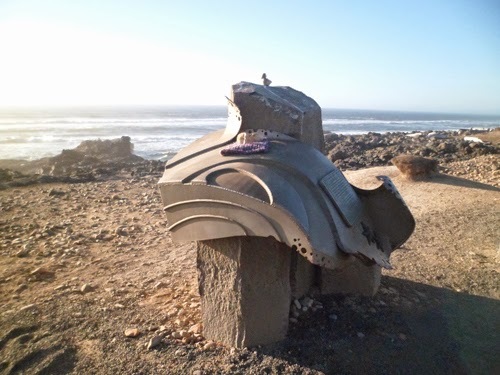 The memorial beseeches one and all to respect the power of the sea. Goodnight all. I will be heading out to paint first thing in the morning! What an adventure! Thanks for sharing. Do you take your own food or do you scout before hand and find like minded places to eat? Thank you again for allowing all your readers the best in armchair traveling! Hi Jackie! In this case I took my own food. It is hard to find basic, simple, healthy food when I travel outside of Portland, Oregon! The coast is particularly bad. There is the occasional Thai food restaurant but they are few and far between. If I have a mini fridge and a microwave or toaster oven I am good to go. I have brought my own toaster oven on occasion! Great trip, aside of the car trouble.It looks like you found some great painting spots! 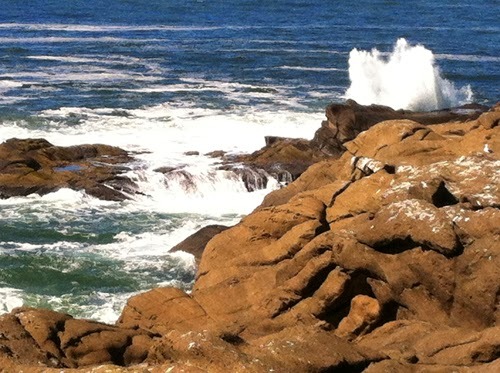 I like the shot with the rocks and surf.